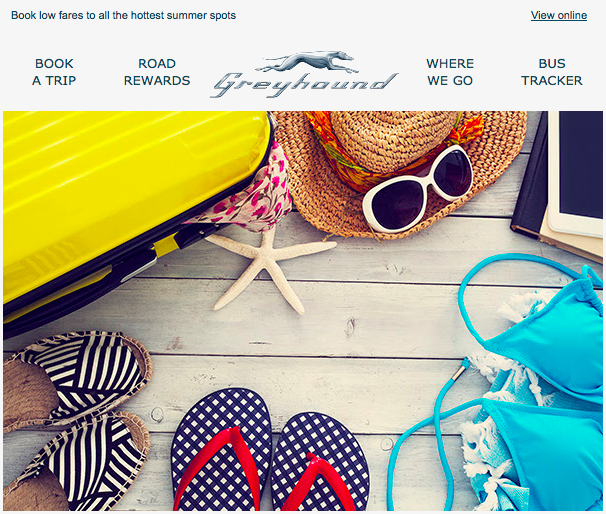 Have you got all your summer email campaigns planned out? Worried it’s too late to get started? Or are you confused at how to reach your customers effectively? In this blog, I’ll look at how to grab your subscriber’s attention with these top five things we like to see in our inboxes during the summer. Sifting through the inbox is no laughing matter. Most people will enjoy a good pun. Jazz up your emails with a funny subject line or slip it in your content of the email. 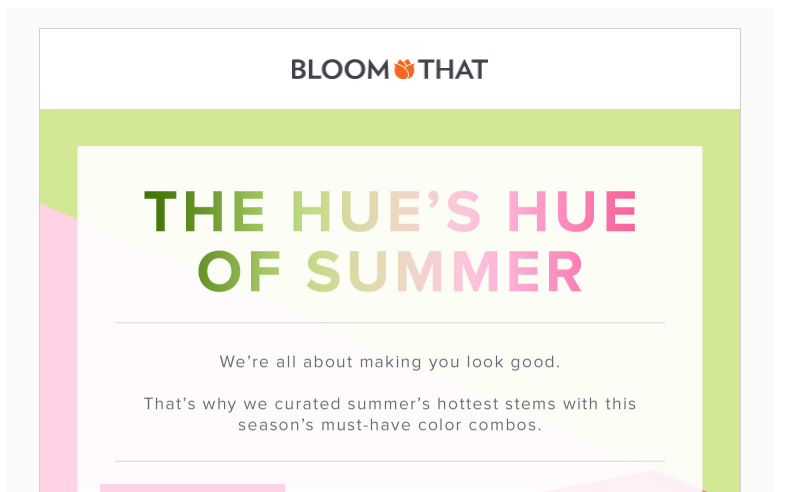 BloomThat uses the clever pun “The Hue’s Hue Of Summer” which is not only witty, but also incorporating a popular summer flower. No one can be deny the allure of cheesy jokes, but it’s best to use puns in moderation 😉 If it’s the right tone for your business, you can mess around with the wordplay to increase engagement with your followers. 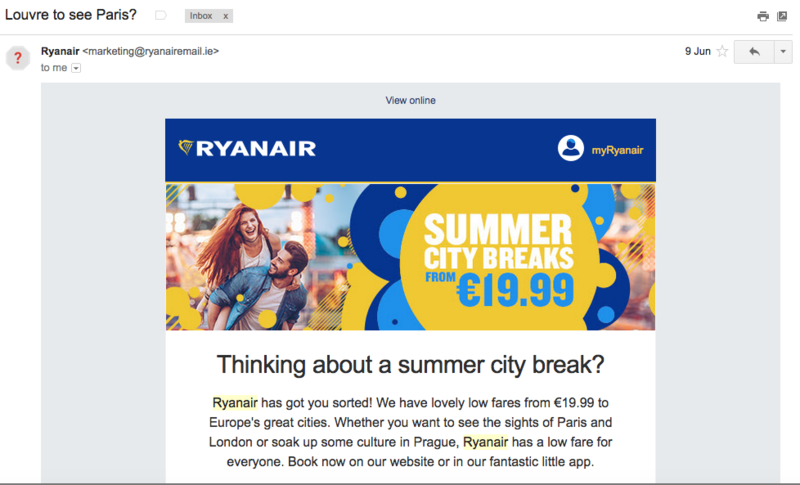 Ryanair has the right idea here “Louvre to see Paris”. A sense a humor will always stand out over other email campaigns, you want to make your subscribers laugh – it makes them feel engaged and more likely to remember your brand.. And hey, they’ll always give your email that second look. Give Them The Travel Bug! Summer is typically associated with vacation time. Take advantage of this and remind subscribers why your product is useful or relevant in the summer. You can see this in the example with Moleskine – “Record your summer journeys”. 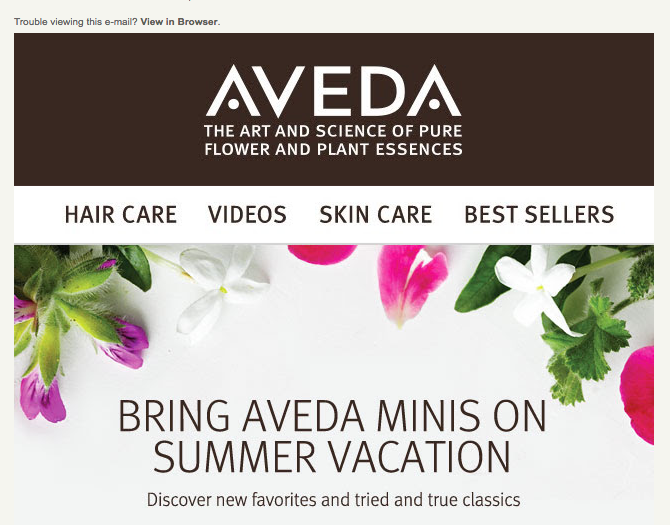 Similarly with Aveda, their summer email is targeting travelers with their “aveda minis on summer vacation”. It’s no surprise that summer can often be a slower season for sales, so this works as a very low-cost tactic to drive additional sales, bonus points if the products are summer related. 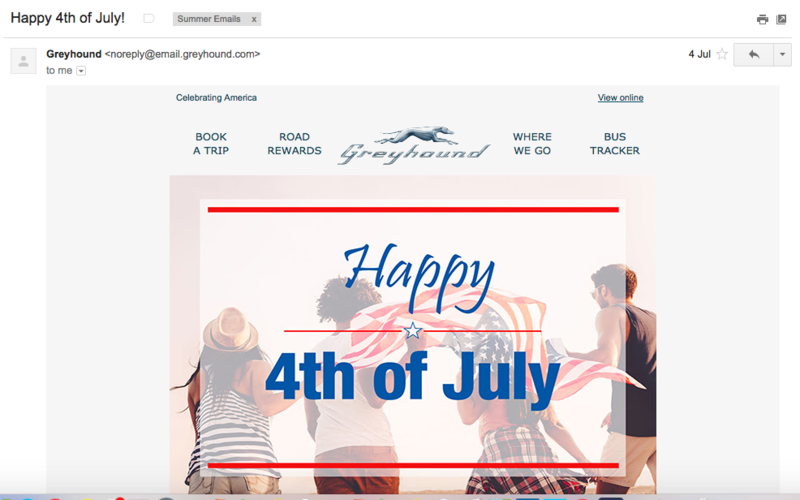 Whether it’s 4th of July, Memorial Day, or Labor Day, these summer holidays are a prime opportunity to connect with your subscribers in a meaningful way. Email campaigns don’t always have to be about promoting a sale, a simple “hello”, “thank you to our troops” or acknowledgement of a marked holiday builds trust with your subscribers and keeps your brand top of mind. Take this SuperShuttle example below. 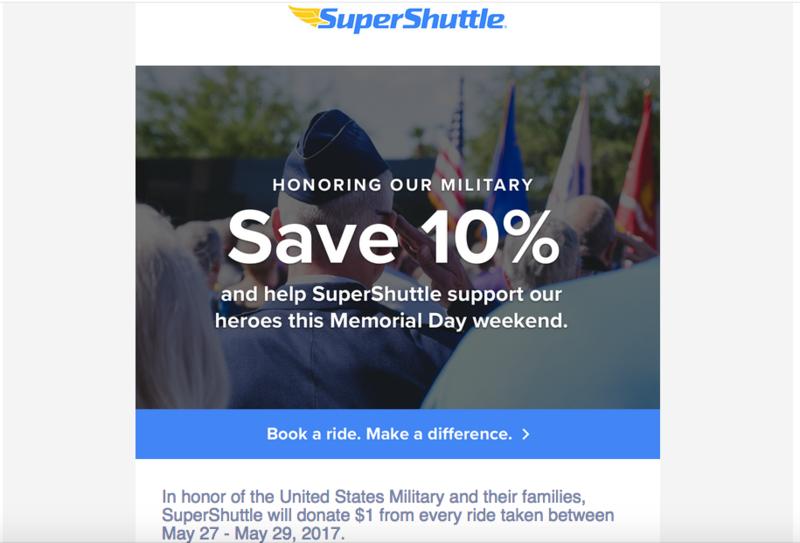 Leading up to Memorial Day, their newsletter contained an offer to book rides over Memorial Day Weekend for a discount, while a portion of the proceeds goes straight to the United States Military. There’s no need for an extravagant campaign, as mentioned above, you can also just mark the day with relevant imagery, festive colors and appropriate wording. Emojis, when done tastefully and not to excess, are a great way to stand out in the email inbox — bonus points if they’re summer-related. Lastly, one thing to watch out for when playing around with emojis in your email campaigns is that email clients display emojis in different ways. Be sure to test any emoji in your email subject lines before sending to avoid this dreaded symbol ☐. Bring your emails to life this summer with animated GIFS. Not only are they engaging and lively, they add personality and playfulness to your email campaigns. Loft and Banana Republic have their emails down to a tee. Done correctly, GIFs can simultaneously portray the sentiment of an email (celebratory, last chance offer, etc) while also showcasing the actual products or items on offer. GIFs are more straightforward than people believe. Try them out for yourself in your next email campaign and let us know how they work! So, take some of these ideas and get creative! Unleash your inner comedian and start drafting a stellar email campaign to send before it’s back to school season. You still have time! 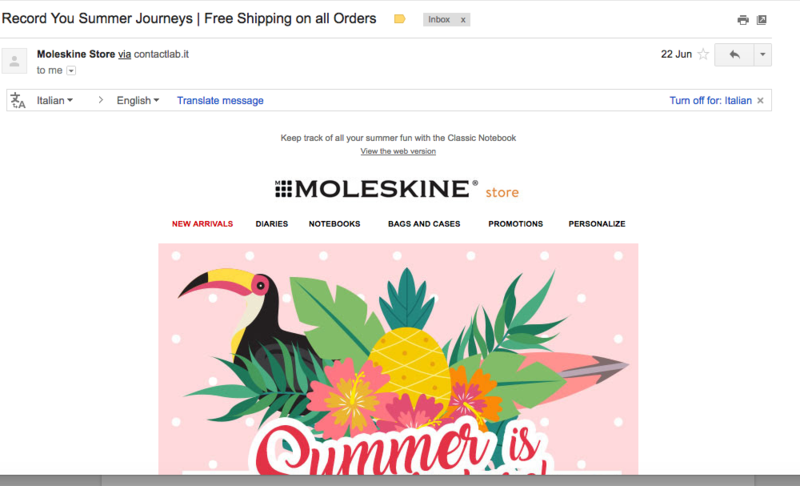 We want to hear about your favorite summer email campaigns. If you have any questions, feel free to comment below, or reach out to us on Facebook or Twitter.